Raga Madhuvanti has been chosen to balance increased Vata and can even prevent it increasing in the first place. It is traditionally heard in the late afternoon. The instrument chosen for this recording is the Bansuri (Bamboo Flute), one of the original and oldest instruments. Resonant, soft and long drawn out notes that are soothing and have a wistful quality can be played on it. In Indian mythology the flute is associated with Lord Krishna, a young herdsman who spent the nights playing his soulful melodies in the forests of Vrindaban. It takes decades of practice to accomplish the wealth of tonal nuances that are achieved through the subtle blowing technique and the gradual covering of the seven holes. Rhythm is created by swift movements of the tongue. The flutist uses different flutes to achieve the different notes and the flute is often changed during a Raga. Madhuvanti portrays a young man, who sits alone by a river on a calm, warm afternoon, far away from civilisation, waiting for his loved one to arrive. Alap, the meditative part of the raga is purposefully played for a longer time - 32 minutes. Here the notes are introduced and the theme of the raga is developed. Pandit Ronu Majumdar plays expanded meends (gliding tones) and lets the notes fade away. The alap is the most important section of this raga for balancing Vata and it should not be missed out. In the next section, jod, the pakawaj is introduced. This two-sided drum is played by Ronu’s brother, Durga Prasad Majumdar. Over the years this drum has been replaced by the tabla, but it has a deeper, fuller tone that has a calming effect and draws the listener more into his inner soul. Durga Prasad Majumdar plays an eight beat cycle without any variations. This method of playing and the tone the pakawaj allows Pandit Ronu Majumdar to play the rhythms and variations of the 15 minute jod in a way that does not excite Vata. The quicker, melodic jhala section is not played. The main part of the raga - gat - starts in jhap taal, a rhythm of ten beats, played in madhya laya (medium tempo). Jhap taal is defined as follows: dhin na | dhin dhin na | thin na | dhin dhin na (10 beats of 2 + 3 + 2 + 3). Then follows the drut, or faster gat, played in tin taal (rhythm of 16 beats). Tin taal is defined as follows: dha dhin dhin dha | dha dhin dhin dha | dha tin tin ta | ta dhin dhin dha (16 beats of 4 + 4 + 4 + 4). To maintain the meditative and calming effect of this recording, Satyajit Talwalkar plays the tabla in a subdued manner. During the mixing of the recording the volume of the tabla was placed more in the background. Two tanpuras are used throughout this recording. The tanpura is a stringed instrument where the open strings are played in a constant tempo to produce the background tones for the raga. Just the tone and evenness of the tanpura alone is calming for Vata. 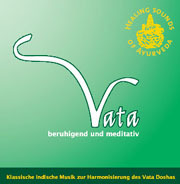 This recording of Raga Madhuvanti can be played during the whole of the Vata period in the late afternoon – appox. 2 - 4 p.m. For therapeutic purposes the half an hour of alap is the most important for listening. Pandit Ronu Majumdar was born in Varanasi in 1963 and from an early age he was taught by his father, the flutist Dr. Bhanu Majumdar. Later he received training from the famous singer Pandit Laxman Prasad Jaipurwale who inspired him to become a student of the maestro flutist Pandit Vijay Raghav Rao. In 1981 Pandit Ronu Majumdar won first prize in the All India Radio Music Competition. In 1982 he took part in the Asian Festival and during the Indian Festival in the USSR he played in the orchestra of Bharatratna Ravi Shankar, who has been giving him further instruction since that time. Pandit Ronu Majumdar’s yearly calendar contains concert venues in all parts of the world. His 1996 album, "Tabula Rasa", published by Water Lily Acoustics, was nominated for a Grammy Award. Durga Prasad Majumdar was 11 years old when he had his first instruction on tabla and pakhawaj from Pandit Girdhar Prasad Jaipurwale (Jaipur Gharana). Later he had the honour to become a pupil of Padma Vibhusan Kishan Maharaj (Nestor of the Banaras Gharana). Satyajit Talwalkar is the son as well as a pupil of the great tabla maestro Pandit Suresh Talwalkar. Rhythmically accomplished he now accompanies the distinguished exponents of Indian classical music, and beyond that has also established himself as a solo artist.